“Marist Asia Foundation” in Ranong approved! 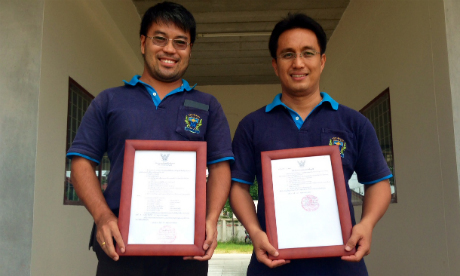 Fr Kevin Medilo (Director) and Kru Prasit Rugklin (Principal) proudly show the official Thailand Government documents approving Marist Mission Ranong to operate now as a Charitable Foundation called ‘Marist Asia Foundation’. Fr Kevin, Director of Marist Mission Ranong, shared it has been a long but worthwhile journey to become a Foundation. We officially received approval on the 30th May 2014. This is wonderful news for us as it recognises on a National and Local level the work we do among the Burmese Migrant Community. For the past several years Marist Mission Ranong has been operating under the Surat Thani Catholic Foundation, which has enabled the project to begin and establish its programmes serving Burmese Migrants needs in Education, Health and Migrant Support in Ranong. Becoming a registered Foundation in Thailand provides our work with a legal identity and protection and is another step toward sustainability. Kru Prasit, who has been heavily involved in meetings with Government officials and providing the proper documentation required shared his delight in getting final approval. It raises our profile in the local community of Ranong. To be granted Foundation status in Thailand is special as it known among Thai people that you are truly serving the community and are not seeking profits or self interest in the works that you do. As an organisation it allows us to process work permits and visa applications for staff and international volunteers who come to assist us in our work. We are grateful to our new Board Members, local Thai supporters and many generous people for their continued support and commitment. For the past seven years many Burmese migrants refer to us simply as MMR, the shorter form of Marist Mission Ranong. In the near future the signs outside the school, the labels on the school vehicle and website will all show the new logo. What remains unchanged is the name and the spirit: Marist. Good news indeed for all Marists in Asia! ← MAP leaders meet in Davao, Philippines!